It takes in some stunningly unspoiled parts of the Irish countryside and goes through mountainous areas, the rolling landscape of river valleys, and seascapes. You will be able to visit some of the finest gardens, historic mansions and splendid medieval ruins, as well as museums art galleries and wonderful little shops in the cities and villages along the way. You will be in places where some of the best golfing, walking, fishing and riding is available and there are really outstanding restaurants in the areas that we would suggest for overnights. With a pub to every 300 of the population they are never far from a convivial meeting place, often with impromptu music sessions. Featuring: Dublin, County Wicklow, Kilkenny, Cashel, Cork, Kinsale, County Kerry, Shannon, Connemara, and County Clare. Arrive to Dublin. Private transfer from Dublin airport to the hotel. Explore the city and surrounding countryside. Dublin has long been a center of art and culture. Stroll through the elegant Georgian streets of Merrion and Fitzwilliam Squares, shop in the elegant emporiums of Grafton Street and Powerscourt Townhouse, explore the collections of the National Museum and National Gallery, the Irish Museum of Modern Art, and many fine small private collections. The city is over a thousand years old, and many of the towns and settlements that surround it are equally ancient. Successive centuries have left their distinctive overlays of character and architecture which means that Dublin has a wealth of historically significant and fascinating sights to explore such as Dublin Castle, where the Normans ruled from the 12th Century, St Patrick's Cathedral, of which Jonathan Swift was Dean, and Trinity College, famous for The Book of Kells and for its alumni who include Oscar Wilde and Oliver Goldsmith. And no visit to Dublin could be complete without visiting either the Old Whiskey Distillery or the Guinness Storehouse! To the North is Newbridge House, is the haunted Malahide Castle, which is also home to a huge model railway and collection of dolls' houses. The valley of the River Boyne, where the world famous Brugh na Boyne monuments (Newgrange, Knowth and Dowth) have stood for over 5,000 years, is about 1 hour drive from Dublin. Nearby are the early Christian sites of Mellifont Abbey and Monasterboice. Following the Boyne towards its source you could visit the Hill of Tara, ancient seat of Ireland's High Kings, and Trim with is great castle. Nearby is a quite extraordinary 18th Century ferme ornee at Larchill and on the way back to Dublin is Castletown, the largest Palladian stately home in Ireland. Newbridge House is a delightful 18th century manor is set on 350 acres of parkland, twelve miles north of the city center and has one of the finest Georgian interiors in Ireland. Each room has its own style of antique and original furniture - indeed the house appears more or less as it did 150 years ago. The house was built in 1740 to a design by James Gibbs for the Archbishop of Dublin and contains elaborate stucco plaster-work by Robert West. From the Coast to the Mountains go "completely off the beaten track". Discover remote Film locations Braveheart, Excalibur, Michael Collins, Reign of Fire, Ballykissangel, King Arthur (2003). County Wicklow , known as the Garden of Ireland, is 750 square miles of rolling hills, mountains, and waterfalls, there is only one way to see the real County Wicklow. Leave the city behind for the east coast, travel along Dublin Bay to Dun Laoghaire visiting The James Joyce Tower, passing through Dalkey home to Bono of U2, Enya, Van Morrison, Maeve Binchey, Dalkey is also a heritage town complete with its very own historical castles. Discover A mysterious rugged land of doomed granite, purple glens with silvery streams rushing cool and clear from Mountain and bog land to swell the rivers or dash headlong towards the sea "The Garden of Ireland" Kilruddery has been home to the Brabazon Family (the Earls of Meath) since 1618. Killruddery House is the most successful Elizabethan-Revival mansion in Ireland and also one of the earliest. In the 1820s the 10th Earl engaged the fashionable architects of the day - Richard Morrison and his son William - to remodel Killruddery. In the 1950s the house was greatly reduced to its present day proportions, but much of the Morrison's design and architecture still remain. Visit Powerscourt House and Gardens,Glendalough, follow in the footsteps of Saint Kevin, who established this spectacular 6th century monastic settlement, deep within the Wicklow Mountains, surrounded on all sides by steep mountain passes. Be sure to leave time to explore the west side of the Mountains - Russborough House, home of the Beit collection of old master paintings. Tour to the South east The Stud of Kildare and The Japanese Gardens, The Castle of Dunamase, Castleruddery Stone Circle, the mysterious fort of Rathgall, the gardens of Altamount, and the city of Kilkenny. Explore Kilkenny city, full of medieval laneways, inns with tales of witches, a great castle and of course lots of shops. Follow the valley of the River Nore to Bennetsbridge, with its many craft workers studios, Thomastown with the Cistercian abbey of Jerpoint and the Jack Niclaus golf course on the rolling estate of the Earl of Carrick's mansion, Mount Juliet (now a hotel) and Inistioge with its romantic gardens surrounding the shell of Woodstock House. The adventurous could visit the Kennedy homestead at New Ross, the gardens of Kilmokea at Campile, Tintern Abbey and The Lighthouse on Hook Head and the Dunbrody, a replica sailing ship. From Kilkenny head south. The route brings you to Cashel, a limestone outcrop rising from the plain and crowned by the cathedral and round tower. Sheltering at its foot is Bru Boru, a entertainment of Irish music and dance. The back road to Cahir, through Golden, will bring you past the riverside ruins of Athassel Abbey and the legendary Motte of Knockgraffon. Cahir has a huge castle in a fine state of repair and a wonderful "Swiss Cottage" built as a folly in the Regency period. A Superb example of an early 19th C. "cottage orné". It is also a center of antique shopping. From Cahir you should follow the road over the Vee, climbing high up into the Knockmealdown mountains (watch out for the sheep and the monster of Bay Lough!) and coming down into Lismore whose castle gardens was for many years home to Fred Astaire's sister Adele. From Lismore head towards Midleton. Visit Barryscourt Castle Gardens, which is the 16th century seat of the Barry Family. The present castle is a fine example of an Irish Tower House. Both the Main Hall and Second Floor Great Hall have been extensively restored with fittings and furnishings reinstated. The Orchard has been restored to an original 16th design and the herb and knot garden has been reinstated in the bawn. You could spend a week exploring the Cork area and still not have seen all the highlights. The Bells of Shandon, The English Market, St Finbarre's Cathedral, The Glucksman Gallery, The Honan Chapel, The Victorian Jail and The Crawford Gallery are a few of the highlights of the city. Blarney Castle and Gardens, with its eloquent stone is a short drive to the north. Further North are Mallow Castle, the gardens of Annesgrove, the forest park of Doneraile, and the remote Boggeragh Mountains. Next visit Fota House, Arboretum and Gardens. Fota House, Arboretum Gardens is an architectural masterpiece, a treasure house of art and a place for people to enjoy. Fota House is owned and managed by the Irish Heritage Trust. Further south west you’ll find Kinsale, gourmet capital of Ireland. You will find brightly painted villages, mad folk museums, amazing sub tropical gardens and host of craft workers, farmhouse cheese producers and enchanting cafes, bars and restaurants. As you carry on down the coast the golden beaches begin to disappear. By the time you reach Mizen Head the seascape is as wild as anywhere in the world with the Fastnet light flashing its warning in the distance. Tour to County Kerry Bantry House is a delightful stop. The house, with its "staircase to heaven" gardens is a wonderful example of a landlord's home and has a stunning collection put together by the 2nd Earl of Bantry who did well at Napoleon III's bargain basement sale at Versailles. Pick up a picnic at Mannings Food Emporium in Ballylickey and then visit Garnish Island, a garden with no house laid out in the early 20th century by the great designer Harold Peto to take advantage of the gulf stream. On the boat ride out there watch out for seals. There are several boats going to the island but the prettiest harbor is definitely the Blue Pool, particularly when the rhododendron are blooming. The fearless driver should follow the Priest's Leap road, a single track lane way across the mountains that comes down to Kenmare. Leave plenty of time for Kenmare, or even consider staying there - it has excellent pubs and restaurants, some beautiful shops, and a generally relaxed air. Whether you stay in Killarney or Kenmare you'll want to explore the three famous peninsulas of Kerry - The Ring of Beara, The Ring of Kerry and The Dingle Peninsula. Each takes a full day of over 100 miles of stunning seaside with the mountains always beside you. Kerry is a land of contrasts - velvet green golf courses, empty golden beaches, rugged cliffs, exotic gardens, wild scenery, unchanged since the ice age, hidden communes of artists and writers, stone age monuments, and fish filled rivers and lakes. When going around the Ring of Kerry be sure to visit St Flanans Bay where the wild fuchsia carpets the countryside and the Skellig Chocolate Company for the best chocolate in the world. Derrynane House is also worth a visit, which is the ancestral home of Daniel O'Connell, lawyer, politician and statesman. Situated on 296 acres of park lands on the scenic Kerry coast, the House displays many relics of O'Connell s life and career. Tour to County Galway From Kerry you'll head up through Limerick, passing Rathkeale and Adare, a very pretty village and well worth a stop. There are three abbeys here as well as the Desmond Castle and the Trent Jones golf course surrounding the neo-gothic Adare Manor. Head out towards Shannon, stopping off at Bunratty Castle and Folk Park on the way. Visit Knappogue Castle. The original tower house of Knappogue Castle was built by Sean Mac-Con MacNamara in 1467. During the 1641 rebellion the castle was occupied by Cromwellian forces. In the 19th centuries further additions were made to the original structure. The castle was abandoned in the 1920's and was restored by the Hon. Mark Edwin Andrews and his wife Lavonne in 1966. Today world famous Medieval Banquets are held at the castle. The beautifully restored Walled Garden at Knappogue Castles offers horticultural therapy, a healing environment and provides a tranquil haven with something of interest for everyone. Next stop is Craggaunowen - the Living Past is Ireland's original, award winning, prehistoric park. Situated on 50 acres of wooded grounds, the park interprets Ireland's prehistoric and early Christian eras.Visitors can for example see a replica of a Crannog (Lake Dwelling), Ring Fort, "an Iron Age Roadway" and an outdoor cooking site. Craggaunowen castle which was built around 1550 is also situated on the grounds. A major feature is the "Brendan Boat" built by Tim Severin who sailed from Ireland to Newfoundland, reenacting the voyage of St. Brendan, reputed to have discovered America centuries before Columbus. See animals such as Soay sheep, Jacob sheep and wild boar. Leave County Clare and head towards Connemara and stay at Ashford Castle for 2 nights. Second day spent exploring the area. On the east side of Lough Corrib are the impressive remains of Ross Friary. 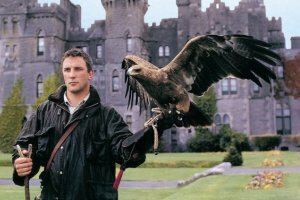 Ashford Castle, where Pierce Brosnan was married, was also the setting for the movie The Quiet Man. The riding center there offers trekking though the estate. Nearby are the stone circle of Cong and the Gods of the Neale. The woods in the are have deep caves with subterranean rivers, the most famous being the Pigeon Hole. At Maam you can visit a sheep farm and at the far end of the valley you'll come out to Killary Harbour, a glacial fjord. 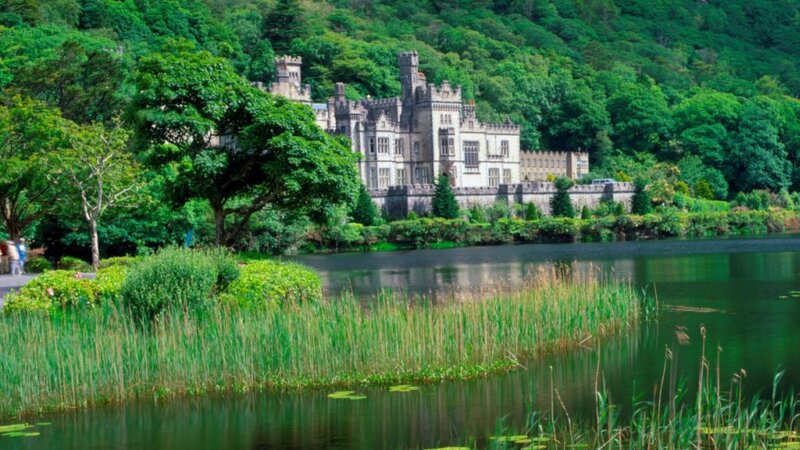 Kylemore Abbey, a Benedictine school, is beautiful and has a recently restored Victorian garden. Clifden, the capital of Connemara is known for its tweeds. Be sure to follow the Sky Road into Clifden, and if you have time visit some of the coral beaches out towards Cleggan. Visit the most westerly garden in Ireland Errislannan Manor: a family estate on the tip of Errislannan peninsula south of Clifden with walled garden, woodlands, lake and pony stud. The house was rebuilt in 1851 by Reverend Wall who resurrected the farm and planted 3000 trees on the bare hillside. It was again in a derelict condition when bought by Donal Brooks, a surgeon, in 1956. The walled garden has an herbaceous border and apple orchard; the top half has rose beds, lawn and shrubbery. There is a handkerchief tree, a Judas tree, Gingko and others Enquire at Stable Office for details and brochure - and what is out now. On the way back to Clare visit Dunguaire Castle. Dunguaire was built by the O'Hynes Clan in 1520. In the 17th century the castle passed to Richard Martyn, Mayor of Galway. Subsequently, it was purchased by Oliver St John Gogarty and became the venue for meetings of the literary revivalists such as WB Yeats, his patron Lady Gregory, George Bernard Shaw, Edward Martin and JM Synge. The Castle was acquired in 1952 by Christobel Lady Ampthill who completed the restoration work started by Oliver St John Gogarty. The Burren is the highlight of today’s touring. We’ve a treat in store for everyone this evening when you will spend the night at Dromoland Castle – Ireland’s finest in our opinion. You will want to savor your time at Dromoland so we will get you there early afternoon to capture the spirit. The Burren, from the Gaelic word Boireann is an area of limestone rock covering imposing majestic mountains, and tranquil valleys with gently meandering streams. With its innate sense of spiritual peace, extraordinary array of flora and wildlife, and megalithic tombs and monuments older than Egypt’s pyramids, the Burren creates a tapestry of color and a seductively magical aura which few people leave without wanting to experience again. Next stop is Vandeleur Walled Garden and Center. Beautiful old stonewalls enclose this sheltered Walled Garden (2.158 acres) which is set among 420 acres of native woodland. Formerly part of the Vandeleur Family Demesne, this garden has been restored around the old path system with a horizontal maze, unusual water-features and a free-standing Victorian-style working glasshouse which is accessible to visitors. The garden specializes in many unusual and tender plants that thrive in the area’s uniquely western latitude micro climate. Chess enthusiasts can test their skills by playing the giant outdoor Chess game.